Google this week is launching Cast, which allows users to share access to a classroom projector wirelessly even when they might be on different networks — without any additional device. Cast for Education is an app that works on Chrome OS, macOS and Windows. The app is launching in a public beta today and is available as a free download. The tool allows users who are part of a Google Classroom, at the teacher's discretion, to share their screens on the classroom's projector. 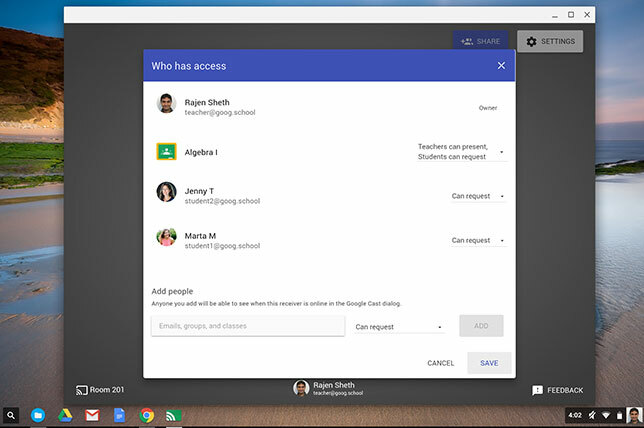 The teacher invites students he or she chooses to participate in screen sharing through Google Classroom. Any student on the roster is automatically eligible to use Cast. Adding students is a mater of setting preferences, which can be adjusted for the entire class or on an individual basis. The difference between Cast and other screen sharing solutions is network-independence. In schools, projectors may be in a different network from the one students are accessing. Cast allows them to use the projector regardless, explained Max Kirsch, product manager for Chrome, in a press conference held late last week. He said that while 1-to-1 computing has become commonplace withing the classroom, the "projector is still kind of disconnected from the rest of the class. Teachers want to be with their students. They want to work with them closely." He said that in speaking with teachers, Google has found that making the projector more accessible seems to be a top priority. "Google Cast was exactly what we were looking for because I could walk around as the kids were working and see a common problem they were facing," said educator and Cast early user Robert Coleman, Hillcrest Elementary, Lake Stevens, WA, in a statement released to coincide with the launch. "I could then have one of the students cast their screen, and within a minute or two all the students could look at this problem and work together to solve it. And then boom, we're back and everyone is working independently again." "Before I knew it, I was co-teaching with a second grader," said Erin Turnbach,Silver Bay Elementary, Toms River, NJ, another early user. (Cast was tested in schools in the United States and abroad before today's launch.) "We were researching animals, and one student was stuck. I was able to work one-on-one with that student, and ask another student to cast and show the rest of the class where to find key facts. One group was researching frogs. "'That is a great piece of evidence,' I said, 'Can you cast your screen to show everyone where to find that type of fact?'" On Tuesday afternoon, June 28, Google's Max Kirsch and Marla McAlister will join educator Tiffany Lucey of Toms River Regional School District for a presentation on wireless screen sharing, presumably including an explanation of Google Cast and demonstration of the brand new tool in action. That presentation will take place from 3 to 3:30 p.m. MT in room CCC 103. Google is also exhibiting in the expo at booth 2511.